Contains premium organic and wild-crafted: Frankincense (Boswellia carterii, Boswellia Sacra), Helichrysum, Copaiba, Holy Basil, Rosewood, Ravensara, Black Cumin, Myrrh, and Pine Scotch essential oils. L-Form™ blend was inspired by continual research in the field of bacterial microbiology. Researchers have identified that bacteria have the ability to preserve themselves by entering into a state known as cell wall deficient (L-form). Within this state, bacteria exhibit extreme durability and resistance to traditional therapies. 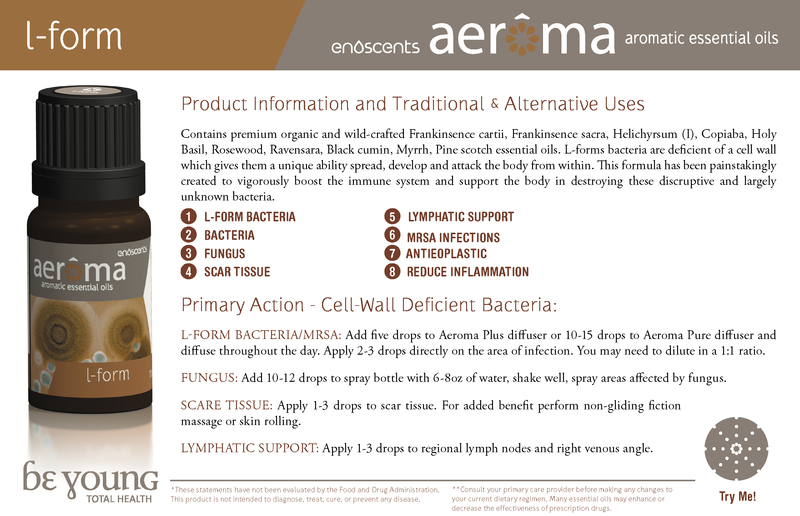 L-Form™ was specifically blended as an alternative approach to L-form bacteria. Many of the essential oils contained within this blend have been researched for their powerful interactions against bacteria, fungus, viruses, and antineoplastic properties. Add 2-3 drops to vegetable capsule, fill the remainder of the capsule with a carrier oils, and take orally in the evening. origin or derived from animals. animal origin or products containing ingredients of animal origin. -Sulphites in concentrations of 1.0 mg/kg or more. -Propolis, Bee pollen, royal jelly. IFRA STATEMENT: This product conforms to the last IFRA restriction. NITRO MUSK: Does not contain any nitro musk. IMPURITIES: This product does not contain solvents (aromatic, halogenated). their ingredients do not contain any genetically modified material. products of animal origin or products containing such ingredients. IFRA STATEMENT: This product conforms to last IFRA restriction. Less is more! Use smaller amounts more frequently. For respiratory tract infections set closer to a diffuser so the aromatic compounds can enter the lungs quickly and at a higher ratio. Add 3-4 drops in an ounce of carrier oil to assist with jock itch.